Yes, it's finally another post. Been kinda busy lately. I'm getting off my duff now because just I saw one particular recruiter, on LinkedIn, exemplifying one of the major things they always tell candidates not to do. 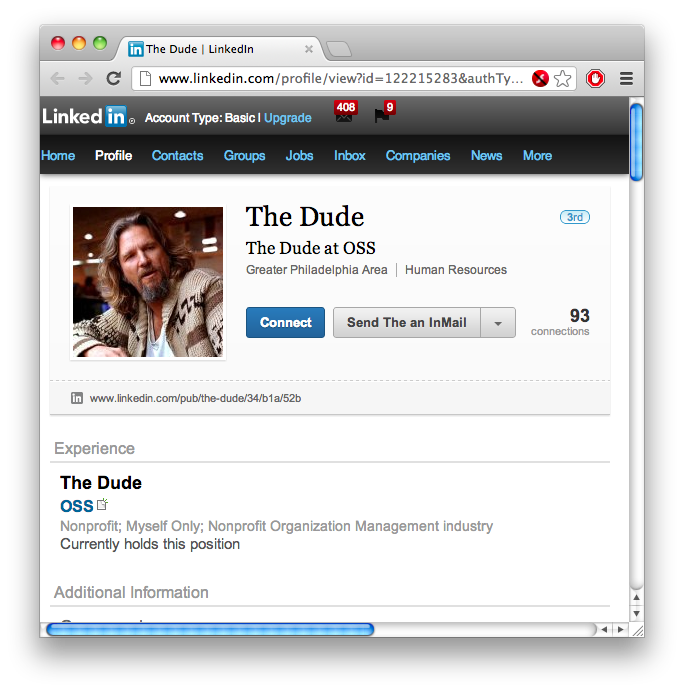 How seriously do you think a recruiter (or indeed anyone) would take you, if you showed up on LinkedIn, or some other place where you're supposed to Be Professional, such as using your real name... and signed up as The Dude, with what looks like a frame from The Big Lebowski as your profile picture? Seriously? Wow. This really makes me want to do business with him... not! I don't think I'd even go bowling with a buffoon like that, let alone let him talk me into a job, never mind hire him to hire other people. Yup, that's it, in all its glorious detail. I clicked on it, and the LI post consisted entirely of a link to a posting on a recruiter's site. I won't embarrass the REAL recruiter by saying what/where the post is, because he is decently professional; I've dealt with him before. It's not his fault he has a lazy bozo for an associate. So all we see from clicking through to LI is that it's full-time and salaried. We still have to follow it further to see decent details. The guy couldn't even be arsed to copy some basics into the post. As you loyal readers well know, one of my pet peeves is such information-hoarding, making candidates waste undue time finding out whether the job is even suitable to apply to... and in my experience, in such cases it's usually not. So, tip to all recruiters out there: not only should you be every bit as professional, informative, etc. as you demand we candidates be... but also make sure your associates are as well, before delegating to them.